Cup holder Seat Cushion Combos are an affordable, effective promotional product for your business or organization. 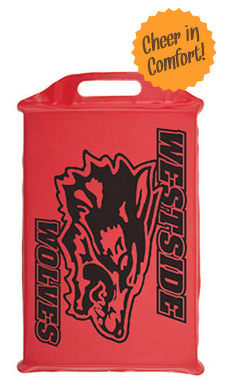 Vinyl dipped stadium cushions are great giveaways for current and prospective customers. Seat Cushions hold 4 beverages are lightweight, waterproof and flexible. Imprint your business logo, message, and contact information for instant branding. Non-skid black bottom for better functionality and durablity. Unique product for your next event!